Navy Funding Navy has received obligational authority totalling $95.6 billion—or 34 percent of the defense dollars. Last year Navy received obligational authority totalling $93.5 billion. Exhibit I summarizes FY 1986 legislative action related to key Navy programs. Gramm-Rudman The Balanced Budget and Emergency Deficit Control Act of 1985 (Gramm-Rudman) signed by the President on 12 December keeps the FY 1986 budget in suspense. Under the Gramm-Rudman law a complicated mechanism has been adopted to reduce future government spending deficits. The law sets a deficit target for each of the next six years. Budget cuts are automatically mandated in any year where the deficit target will be exceeded. These cuts will be across the board unless the President and Congress agree to a deficit reduction plan. The House Armed Services Committee recently estimated that the Gramm-Rudman law will require cuts of $10.3-13.3 billion in FY 1986 defense spending authority. Navy funding for operations and procurement programs will obviously be affected by these reductions. The constitutionality of the Gramm-Rudman law is now being argued in federal court. Meanwhile, as prescribed by the law, the Office of Management and Budget (OMB) and the Congressional Budget Office (CBO) are preparing revised estimates of the FY 1986 deficit. In late January the President is to propose his plan for meeting the FY 1986 Gramm-Rudman deficit target. Planning in DOD is affected by the uncertainty created by this funding suspense. Procurement and Engineering/Design Congress made a number of changes to the FY 1986 Navy ship procurement program. Funds were provided to begin reactivation of the battleship Wisconsin this year, in- stead of in FY 1987. The MCM program was partially deferred due to technical problems and program slippage. A SWATH design has been approved for the T-AGOS program. The Coast Guard has received funding authority to build an icebreaking tug and 16 patrol boats. And a Mariner Fund to build and subsequently lease cargo ships was tentatively funded—subject to authorizing legislation. In weapons and systems procurement, Congress denied funding of the rolling airframe missile. Funds were provided to buy 150 MK-60 Captor mines. The funding for seasheds was increased $12 million from the $30-million budget request. Important changes were made in engineering and design programs. Funds for the SUBACS program were denied due to "severe technical and management problems (which) have significantly increased costs, delayed schedules, and degraded planned system capability." IBM is the prime contractor in the SUBACS program. In place of the $205 million requested by Navy for further SUBACS development, Congress provided $200 million for a new SSN-21 combat system program and strongly criticized Navy and DOD's management of the SUBACS program. 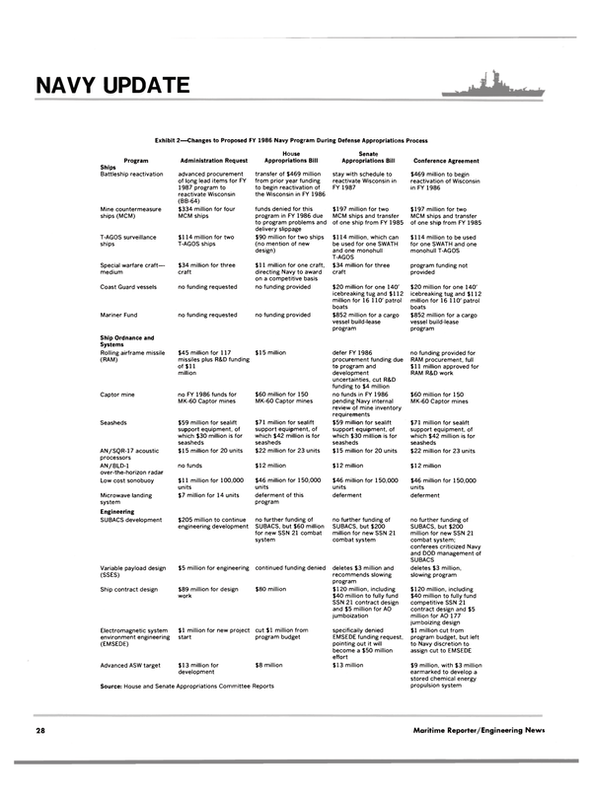 These and other FY 1986 program changes are summarized in Exhibit 2. Congress appropriated $6.1 billion this year for ship maintenance and modernization. This is the full amount requested by the Administration. It will provide funding for 35 active fleet ship overhauls, six naval reserve ship overhauls and 142 short term ship maintenance jobs. Exhibit 3 lists the active and reserve fleet overhauls scheduled for commercial yards in FY 1986. The dollars shown are Navy's estimate of the cost to complete each job. The Congress also issued a number of policy directions concerning homeport policy, yard certification and number of ships to include in this year's public/private yard competition. Future Navy Programs On 3 February the President will send his FY 1987 budget request to Congress. It is expected to call for a 3 percent real increase in defense spending next year. The deficit targets set by Gramm- Rudman, and more generally the growing concern over continued deficit spending, are likely to impact future Navy programs. Look for elimination and stretch out of marginal procurement programs—such as support ships. Navy will likely reduce operational tempo in an effort to save money, with ships spending less time at sea.